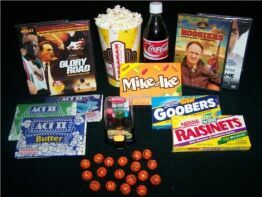 Welcome to MovieNoodle.com, where we have the most unique gift baskets and get well baskets on the net - featuring our Mother's Day Movie Night! Select a package and DVD, and allow us to deliver the total movie theater experience right to someone’s doorstep or dorm room! 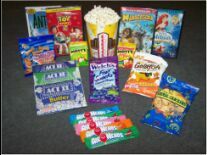 Each shipment comes attractively packaged with a new DVD, movie candy, a theater-style popcorn bucket for the authentic movie experience, & more. We have some of the most unique gift baskets you can find! MovieNoodle offers you the perfect opportunity to send a unique gift to the movie lover in your life - including all the 'perks' of a night at the theater. Priority Shipping on Every Package! ...all the goodies you love to get at the movies can be mailed to anyone, anywhere in the U.S.
Personalized Movie Ticket Note with each order! (click to enlarge).. .